Aesthetically pleasing, and extremely hard wearing, a new slate roof transforms any home and brings with it many practical advantages. Slate is an exceptional roofing material and is one of the most effective ways of protecting your home. With a water absorption index of less than 0.4%, slate is incredibly resilient to frost damage and freezing. Whilst also being highly resistant to acids, alkali’s and other chemicals, it is colour-fast and non-fading, even in UV light. A beautiful natural finish – natural slate comes in a rich array of colours, sizes and thickness which gives a beautiful unique look to every roof. Value adding – the visual appeal and known reliability of slate roofing adds value to any home. Long life – naturally hard wearing, slate roofs easily last anywhere between 100 and 150 years if properly installed and maintained. Fire resistant – slate is one of the most naturally fire resistant materials making it a perfect choice if there is risk of air borne sparks from fireworks, wildfires or nearby house fires. Weather resistant – the hard surface and weight of this natural stone make them ideal for combating bad weather conditions including high winds and heavy rains. Environmentally friendly – if you’re concerned about the environmental impact of your home, slate is 100% eco-friendly. Low maintenance – because of the hard wearing nature of slate it very rarely needs the hefty repairs clay tile roofs require. 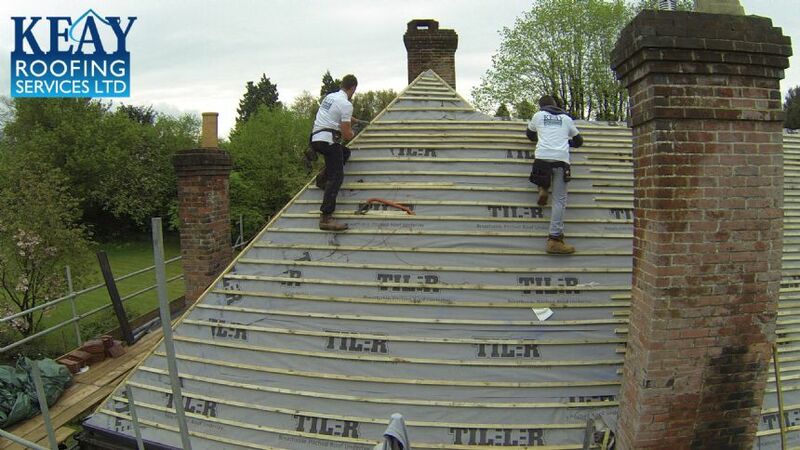 The installation of a slate roof shouldn’t be taken lightly. When installing a slate roof it’s always advisable to seek the help of a professional slate roofing contractor. Their expertise is vital to ensuring that the structural support is sufficient to support the weight. Slate tiles are very heavy (much heavier than clay tiles) and a roof that has not been thoroughly checked might not be able to support the weight. Slate tiles also require shaping by hand to ensure they fit specific roof measurements. This type of tile also has the potential to break when stepped on, making installation an impractical task for many and best handled by an expert to ensure the best fit and finish. Once installed professionally, a slate roof will provide many years of reliability and safety, with very little maintenance. Slate is sometimes referred to as ‘The Hundred Year Roof’ due to its long life. But that does not mean that slate tiles will not occasionally become damaged. If you notice any cracked, broken, loose or missing slates they should be replaced immediately to protect your home from water leaks and stop precious heat escaping. At Keay Roofing services we understand that a few cracked tiles do not warrant a whole new roof. Our experienced roofing contractors will be able to replace your broken slates quickly and efficiently, ensuring that your home remains 100% protected. At Keay Roofing services we incorporate our years of roofing experience into our work, ensuring that the customer is always satisfied. We will always ensure that the slate tiles we fit to your roof are of exceptional quality, we stick to deadlines and our customer service is second to none. If you are interested in having a slate tile roof installed, or your existing slate roof has some tiles that are broken or missing, then please feel free to give us a call on 01753 358267 for a free quote. Alternatively you can click the link to the right and fill in the form and we will get back to you as soon as possible.